Every once in a while, something truly unusual comes along. And now we have something that is indeed truly unusual – so much so that I decided to start off my blog telling the world about it. 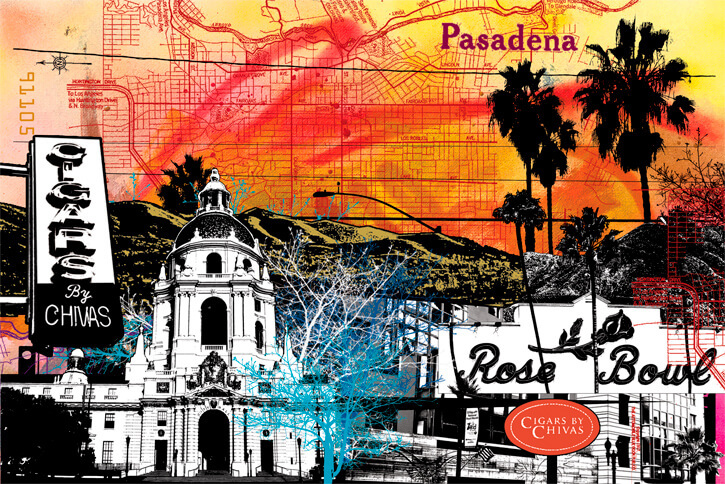 “It” is a limited edition of Pasadena-themed boxes of Zino Platinum Cigars by Chivas Exclusive Edition cigars. We now have our very own Davidoff cigars, presented in boxes specially crafted for us, and existing only in a one-time limited edition of 250. I’m not entirely sure how they got from that to working with Davidoff, but that is what they are doing, and, when I met them, I thought that here was a chance to do something really different. Thus the idea for the exclusive Cigars by Chivas box and cigars. This was the first time I’d come in contact with graffiti artists, and, when we decided to go ahead, I made it clear to them that our clientele isn’t exactly what anyone would call “edgy.” Our average client is over 35, unquestionably male, and resides in or around conservative Pasadena, so I tried to get the artists to curb some of their positive urban-industrial art exuberance. The box has a great and original look – it’s not something you’re going to see coming and going…and it’s not something you’re ever going to see again. (I liked the artwork so much that I had it reproduced inside the lid as well.) We’ve been Pasadena’s Premier Purveyor of Premium Cigars for twenty years now, and I’m proud of the unique city in which we’ve been doing business for two decades. I was glad to get the chance to have something made that would show how, when you put cigars and Pasadena together, you come up with Cigars by Chivas. Oh yes – there are cigars inside as well. Zino Platinums, to be precise, crafted expressly to go with the exclusive Pasadena box. They’re great cigars (and a bargain at what comes to $25 a stick), with an Ecuadorean Habano wrapper housing a Dominican binder, and filler from the Dominican Republic and Honduras (which is something else you don’t see all that often.) The official Davidoff profile considers the cigars “medium-full”, although I can’t imagine anyone not enjoying them. The Davidoff material also says that you can taste (in this order, I think) cedar, earth, almonds, hay (hay??? ), a little saltiness on the lips (what is this, crackers or a cigar? ), white pepper in the retrohale (for the few who are actually physically able to retrohale), hints (but just hints, mind you) of chocolate and spice…and, finally, remarkably creamy vanilla with notes of leather (and who doesn’t like the taste of leather to go with their vanilla ice cream?). If you put a chunk of cedar, a teaspoon of dirt, a couple almonds and some stalks of hay in your mouth and chewed them you would…probably get sick. So forget about the hay and the leather and the hints (just hints, mind you) of chocolate and spice – and just know that our Cigars by Chivas Exclusive is a really good cigar. You know the construction is going to be perfect (it’s a Davidoff), and I think it’s the filler from Honduras that makes the cigars as out of the ordinary as the box. 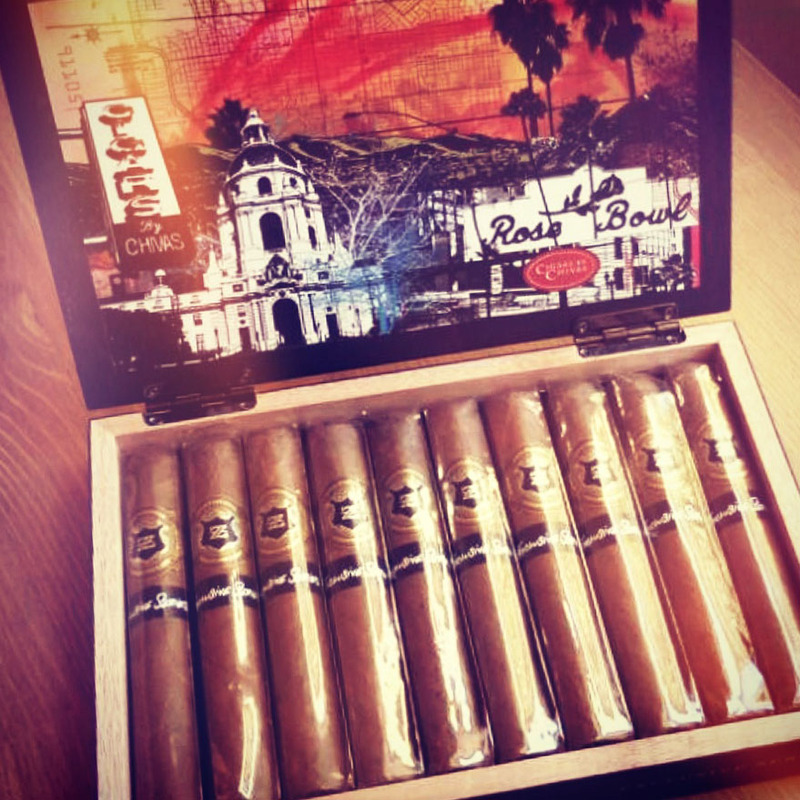 We’re only selling the cigars by boxes of ten, so you don’t miss out on the artwork. (This is a cigar box you’re going to want to find another use for after you’ve smoked the contents.) Price: $250. In the artists’ bio I was sent, they also write that they believe in “the philosophy of creation through destruction.” I want to make it clear to everyone that that principle applies to their work outside in urban areas, and not to our Cigars by Chivas box. Indeed, I think we’ve created through creativity…and a chance to do something you won’t find in any other cigar shop.